We are having one of the most beautiful Spring seasons in my recent memory. 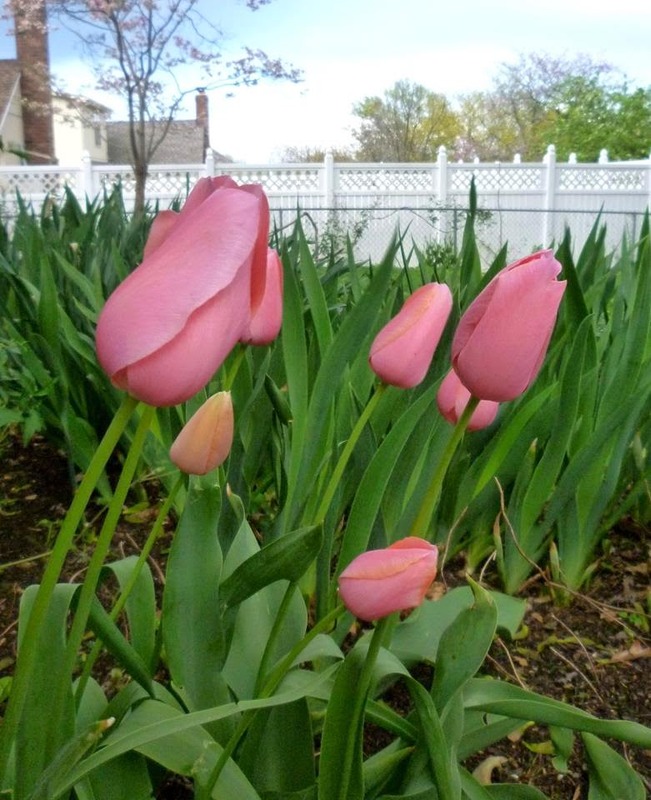 There have been no late freezes to nip back the early blooming bulbs, trees and shrubs….and we haven’t had a lot of the unseasonably hot days that tend to force the cool season flower progression into warp speed. 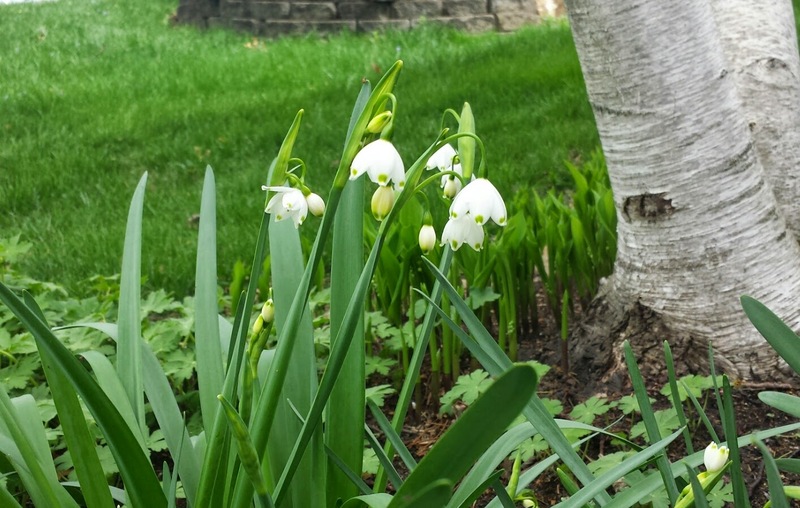 Spring has been long, mild and delightful. We have probably had what many people would consider too many cool, cloudy and damp days….but I don’t mind them at all. They encourage all the lovely blooms to linger and they have a calm, quiet beauty that forces you to take time…and look …and absorb. And they make the sunny days seem all the more lovely. This past weekend we were cool enough that it was downright chilly. As the day progressed I became hungry for a warming bowl of soup. Since I had a batch of freshly made arugula pesto on hand, the soup that immediately came to mind was a Spring soup called Minestra Verdissima….or “a very green soup”. Minestra Verdissima is a light minestrone made with all green Spring and early Summer vegetables. Like minestrone it is finished with pesto…usually arugula or spinach pesto since these are both abundant in the Spring. Because I didn’t have all of the traditional ingredients on hand, I decided to improvise a little…using what I had on hand (going to the grocery store on a Sunday isn’t my idea of fun). For the soup base, I used a bunch of the spring onions I had purchased at Saturday’s farmers market. If I hadn’t had them, I could have used onion or, even better, leek. 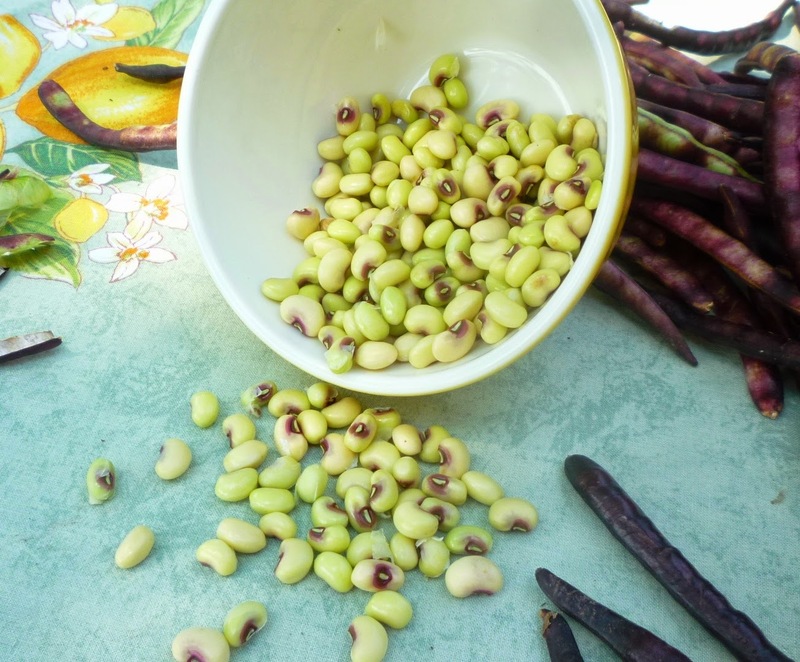 Most recipes for Minestra Verdissima are finished with the addition of some cooked shell beans or rice or small pasta….or some combination thereof. But instead of adding these at the end, I decided to follow Judy Roger’s method for a delicious asparagus and rice soup in her Zuni Café Cookbook: she cooks the rice in the water which ultimately becomes the soup’s broth. And since I had some pink-eyed peas in my freezer (frozen during the height of the season last summer) I decided to add these along with the rice rather than adding the more traditional cooked dried beans at the end. Pink-eyed Peas from the market...last August. For the remaining additions, I again simply used what I had: Asparagus (from the market) and English peas (like the pink-eyed peas, socked away in my freezer last summer). I chose again to follow Judy Roger’s lead and stew the asparagus and peas in a bit of fat (I used butter, but if I had had some pancetta, rendering it and cooking the vegetables in the rendered fat would have been a delicious way to go) before adding them to the soup when the pink-eyed peas and rice were done cooking. with touches of ivory, white or beige from the additions of pasta, beans, rice…or even farro or diced potatoes. The pesto…swirled in at the table…is the crowning touch. It magically turns the soup a vibrant spring green…. Over the years I have come to believe that eating seasonally is about so much more than eating what the earth around me is currently producing. It also has to do with (among other things) eating foods that are in sync with the weather and my mood. On Sunday I was hungry for a homey soup because of the chill in the air and the slow, lazy pace of my afternoon. But while a hearty, traditional minestrone might have seemed perfect, to me it would have seemed jarring with its bold flavors and deep colors. But my little minestra was just perfect. 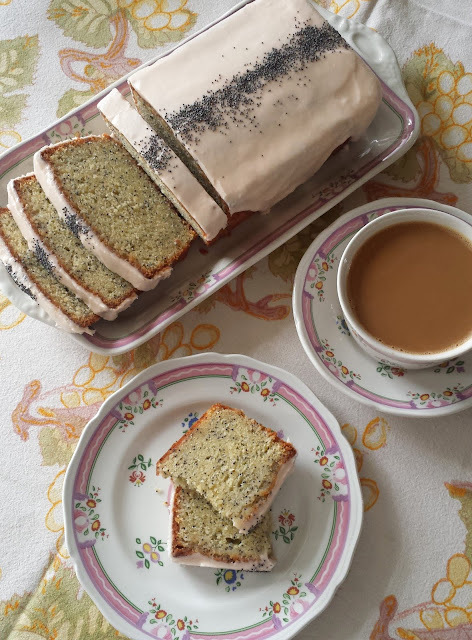 It was filled with ‘seasonal’ produce… was warm and soothing to ward off the chill in the air….and was at the same time permeated with the subtle vibrancy of a cloudy and cool spring day. Heat 2 T. butter in a medium saucepan set over medium-low heat. Add the spring onions and a pinch of salt and sweat until very tender and translucent—about 5 minutes (leeks or onions will take 10 to 15 minutes…don’t shortcut this step). Add the rice, shell beans and 3 1/2 cups water (or stock) and bring to a simmer. Cover and cook until the rice and beans are tender (about 15 minutes). About 10 minutes before the rice and beans are done, melt the remaining tablespoon of butter in a sauté pan set over medium heat. Add the asparagus and peas along with a pinch of salt, stirring to coat the vegetables in the butter. Let the vegetables gently sizzle until they are tender, stirring occasionally. When the rice/beans are cooked, scrape the asparagus and peas into the soup. Swirl a ladleful of the broth around the sauté pan to get all the flavorful bits and add it back to the soup. Bring the soup to a boil and let simmer for a minute or two to allow the flavors to blend. Taste and correct the seasoning. If the soup seems too “crowded” with vegetables, add more water or stock. Ladle the soup into bowls and place a dollop of pesto in the center of each bowl, allowing each person to swirl the pesto into their soup at the table. Pass more pesto on the side if you like. Recipe is easly doubled, tripled, etc. When making this soup, carefully season at each step. Because it is subtle and mild, it will taste bland if not seasoned well. Add a couple of ounces of minced pancetta. To add, place the pancetta in the sauté pan and cook until rendered and beginning to crisp—adding some olive oil or butter only if the pancetta is very lean. When the pancetta is rendered, add the asparagus and peas and proceed with the recipe. As noted in the post this soup can be made with many combinations of starches and green vegetables…I like the soup best when the total quantity of cooked starches (rice, potatoes, beans, pasta) is roughly the same as the quantity of green vegetables…with maybe a little more green vegetable than starch…..
You may use leftover/previously cooked rice or beans (and of course, pasta…choose something small, like soup shells or orzo…). To do this, add the green vegetables to the cooked onion, cooking until just tender before adding water or broth. Bring the broth to a simmer and then add the cooked grain, beans or pasta (adding any bean cooking liquid you might have along with the beans). Bring back to a simmer and serve. Delicious. Such a great soup for spring ingredients. Thank you. I'm so pleased you enjoyed it! Thanks for letting me know.